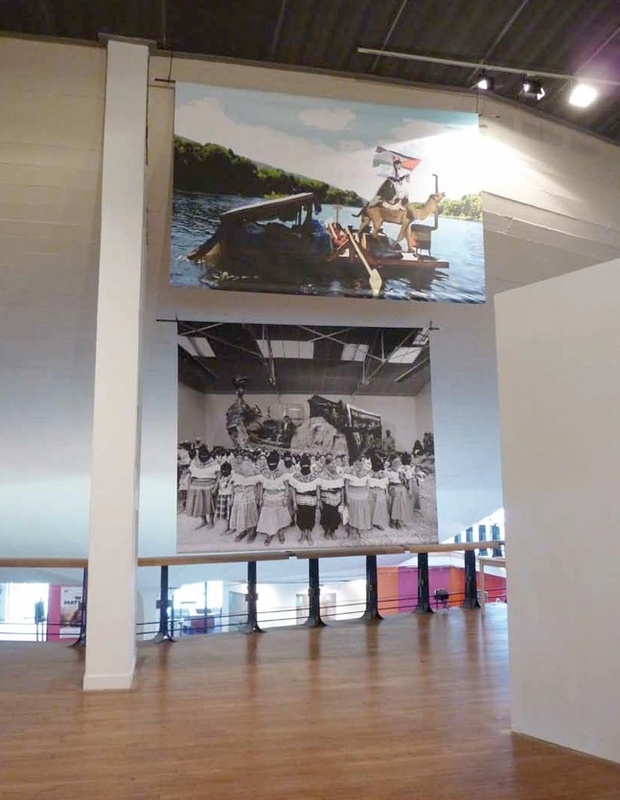 In Amiens, Nikos Charalambidis is showing two impressive prints on tarpaulins hung from the ceiling. Both images are photomontages; they depict scenes constructed by assemblages of images coming from different sources, in the manner of Situationist collages and the work of Archigram (a group of English architects founded in 1936, undertaking forward-looking research into a new kind of urbanism based on a uniform and continuous structure, that can be extended ad infinitum). These two images are part and parcel of Nikos Charalambidis’s current project: the Hollow Airport Museion, which emblematically transforms Nicosia’s international airport, unoccupied since 1974 and still inaccessible because it is in the buffer zone, into a School of Fine Arts and a museum. This travelling establishment moves about in different forms all over the world. It accommodates the activities of Nikos Charalambidis’s other moveable museum: the Arab Guggenheim Museum. Extending the artist’s approach from the 1980s, the “Museion” is a museum in the Greek sense of the term: a space which refuses the mere collection of works, but rather prefers to become a place of creativity and discussion, where poets, artists and scientists can rub shoulders. The first print borrows the poster for the exhibition “Black Little Curly Hair”, which Nikos Caralambidis held in January 2010 at the Kappatos Gallery, in Athens. In it, the artist stages himself: he is depicted on board a raft and disguised as a desert caravanner, on a camel’s back. This small makeshift vessel seems to be drifting in a water course the size of a river. It is almost entirely occupied by this animal and its rider, shown in profile. 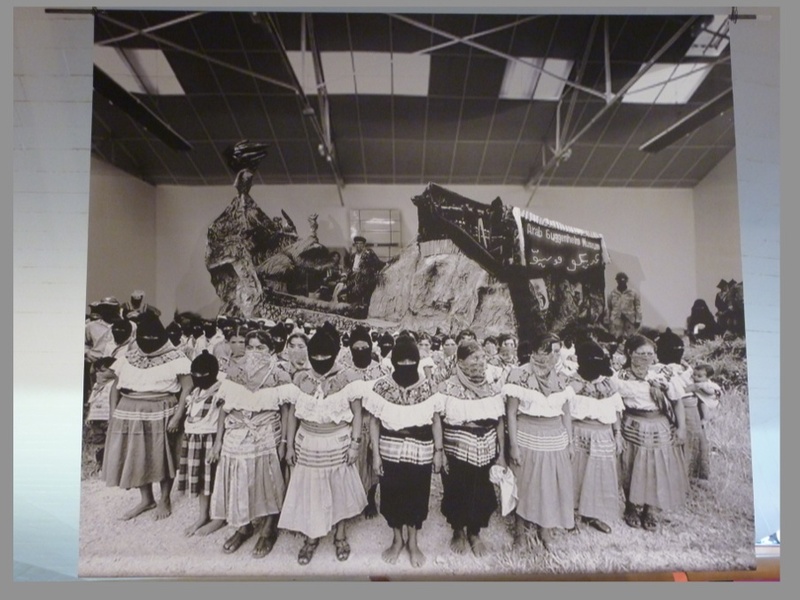 Behind them, on the raft, a dark cloth is stretched tight, acting as a roof to protect the bed beneath it. The forest running along the water course is thick and lush, and thus runs counter to the landscapes usually associated with desert caravanners, as if the vessel had made its way up western currents or, on the contrary, sailed towards the tropical south. The second print is black and white. It depicts a scene where the place itself is vague: at once beneath a roof which might be that of a warehouse or an impressive Kunsthalle, and on the ground covered with grass and dry earth, the space houses a large vessel made of clay. Its entrance is guarded by a man in military uniform wearing a balaclava. Above the vessel’s entrance, a neon reads “Arab Guggenheim Museum”. As in the other print, the vessel accommodates a dwelling: a hut. In front of it, on board, are an elegant woman and a man with the lower part of his face covered. This vessel is surrounded by a large throng made up mainly of women, staring sternly away from their group. Like the man on the boat, they are wearing scarves over the lower part of their faces, calling to mind the imagery of the guerillero or bandit. They are standing, either barefoot or in light sandals, and they are identically clad, very simply, in clothes which might be traditional: white lace blouses and long skirts. A few children, some very young, mingle with the crowd. A few men are also there, in the same demanding posture as these women. The dwellings depicted in each of these images here borrow a leitmotiv in Nikos Charalambidis’s work, and refer to the nomadism that hallmarks his current museum projects. In questioning the idea of the house as a mooring point, and the very notion of “Homeland”, they illustrate the artist’s questions about notions of nation, nationality, and the emergence of post-national identities.